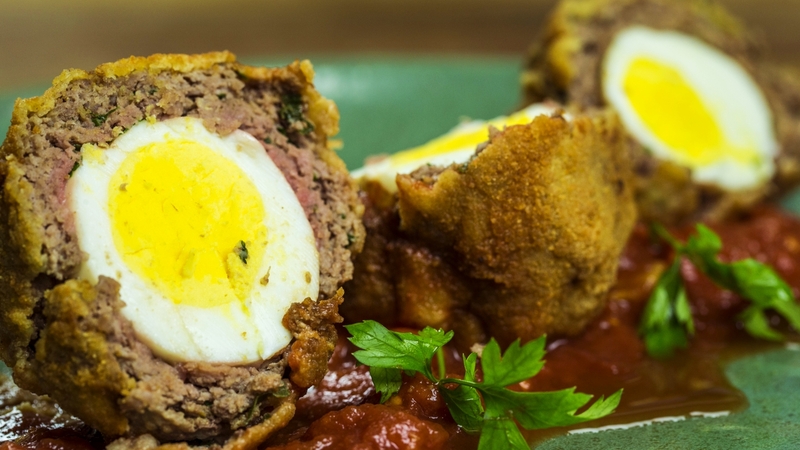 Apparently, there’s a bit of an ongoing controversy over the true origin of Scotch eggs. Turns out our old favorite pub food may not actually be from Scotland after all. Our theory is that everyone wants to claim them as their own because they’re just such a darn good idea! What we are sure of is that these babies are delicious and never fail to deliver a satisfying belly full of goodness. So, we decided to try our hands at recreating it, in an effort to impress our brunch guests with something little bit different than the usual fare. Still essentially a meal of sausage and eggs, there’s something extra indulgent about eating your egg encased in juicy sausage that’s been breaded and fried until it’s crisp and golden. Needless to say, brunch was a hit! Place flour, beaten egg and breadcrumbs into their own separate bowls and set aside. In a large bowl, mix ground beef with mustard, green onion, parsley, nutmeg, salt and pepper until well combined, using your hands. Divide mixture into 4 equally sized patties and mold one patty around each of the hard boiled eggs, making sure the egg is thoroughly encased. Dredge each wrapped egg in flour, then dip into beaten egg mixture, then roll in breadcrumbs to coat. In a deep skillet, heat vegetable oil to 300º F. Carefully place each egg into the hot oil and fry for 4-5 minutes, until golden brown. Remove from pan, let cool slightly and serve!